We had many power outages this last week...only reliably back on yesterday, so could not do my tea. We had over 2 inches of rain...farther to our west, Forks...of Twilight fame...had almost 5 inches...but then, that's a tain forest! But a lot of trees limbs and power lines down. and it's almost time for Halloween and the end of October. Amazing! The above photo is from a 2010 Harrod's London Halloween display ...I just love this!!! Since next week contains Halloween I thought I'd include it again! My niece took the photo and sent it to me. I thought I would share this teacup today instead of a tea party. In case you were wondering...Wileman is the precursor of Shelley China. 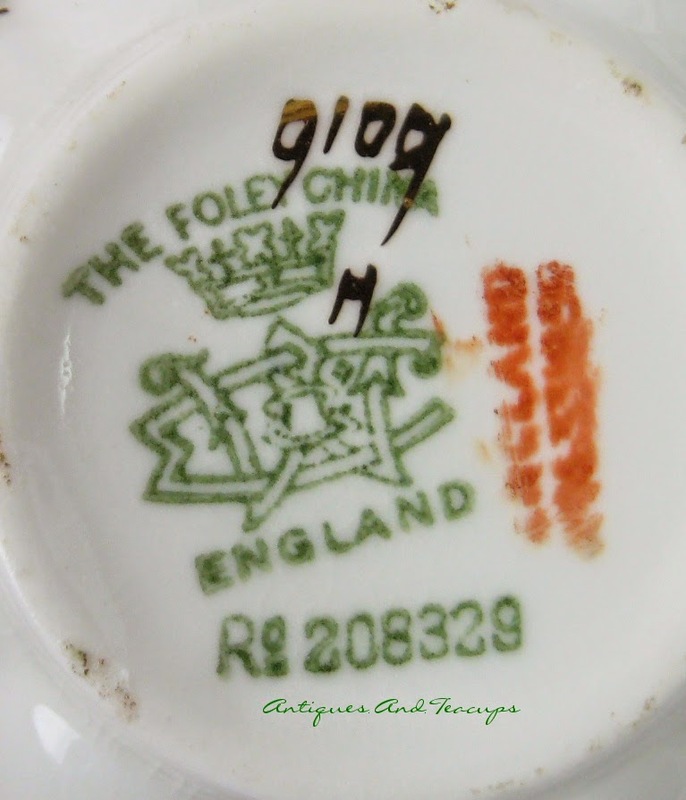 The company was started in the mid 1800s and changed formally to Shelley China in the 1910s, when this shape was discontinued. The Rd. refers to Registry Date, which is when the pattern...number 9109...was registered for use in 1893, but the Shelley pattern books say that the pattern number wasn't produced until 1899 and discontinued with the shape in the 1910s, although the end date is just placed as 1910s. This is the sort of china I have seen on the early seasons of Downton Abbey. The words The Foley at the top refer to the pottery name which was taken from a district in Stoke-on-Trent. I love the fact that the company kept such marvelous records! 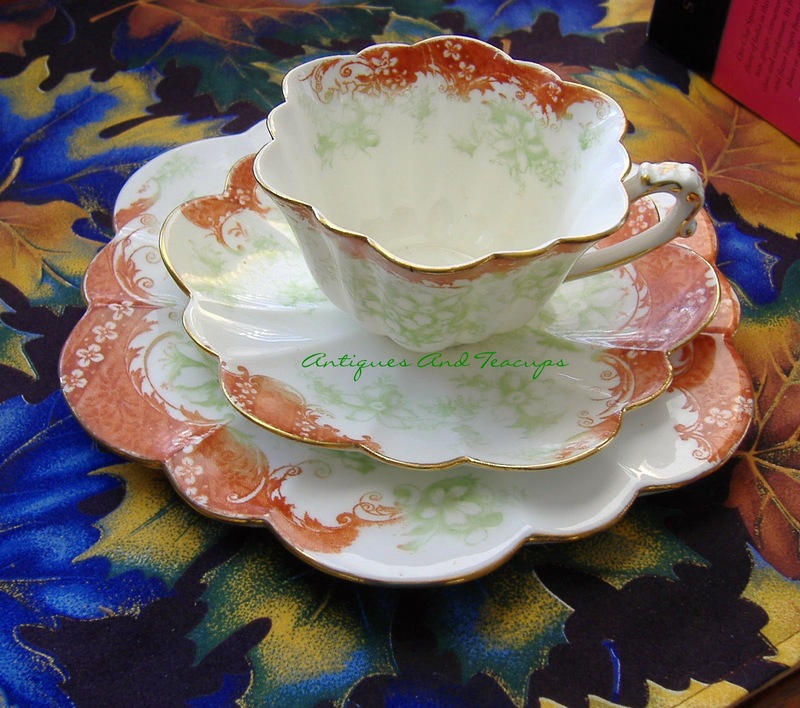 For more info on the teacup trio click on the photos or visit Antiques And Teacups. With lots of other goodies besides crab, of course! Our kids love to visit for this! 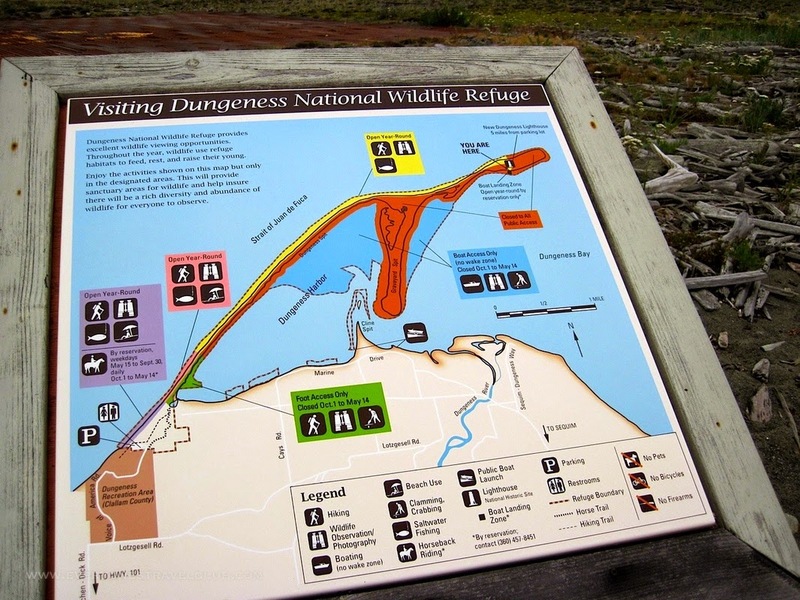 So...to tie this into tea again, I looked around and found a great recipe for Dungeness Crab Sandwiches on Zucchini Bread at a great blog called Tearoom In The Sky. Click on the photo to go visit and get the recipe! So don't be crabby, eat some! 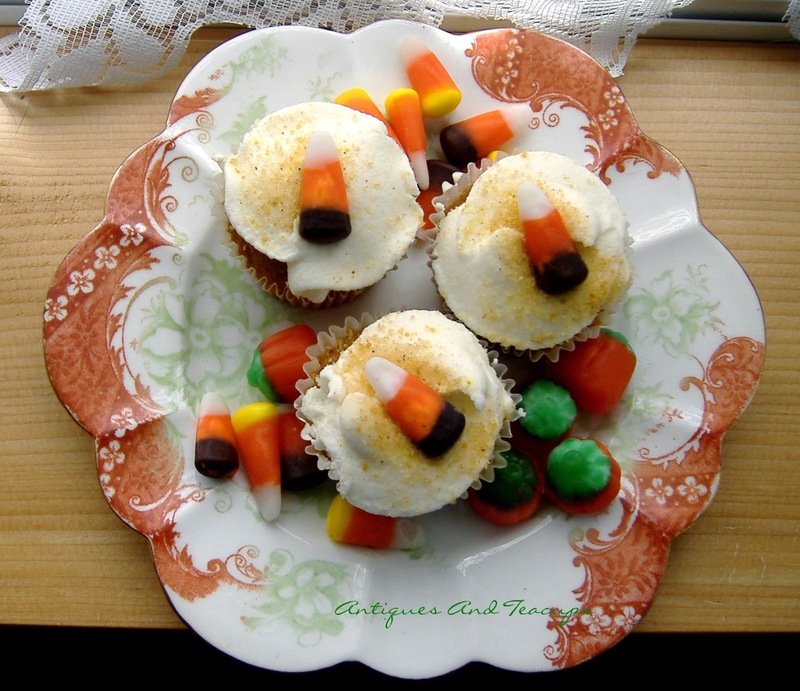 I made pumpkin spice mini cupcakes and decorated them with candy corn! Below is the linky for linking your tea related posts...as always, remember it is SSLLLOOOOOWW but does show up. I love your comments and emails! Have a wonderful week! Oh my, Ruth that tea cup is absolutely gorgeous. I love Foley china - it's so delicate and unique. And yum yum YUMMMMMMM! 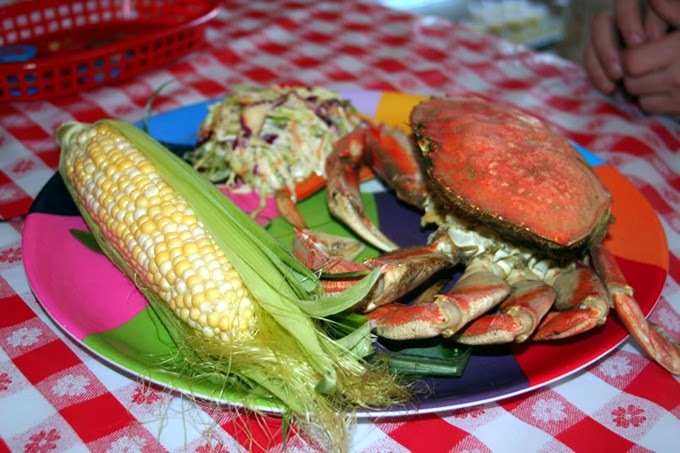 I *love* crab meat - it's so danged delicious! That must be the best place to live anywhere - lucky lady!! Thanks for hosting - so nice to be joining in on the fun this time around. I think you've inspired me to make spice cupcakes tomorrow - just got my new order delivered today of King Arthur's Cake Flour - my very favorite. 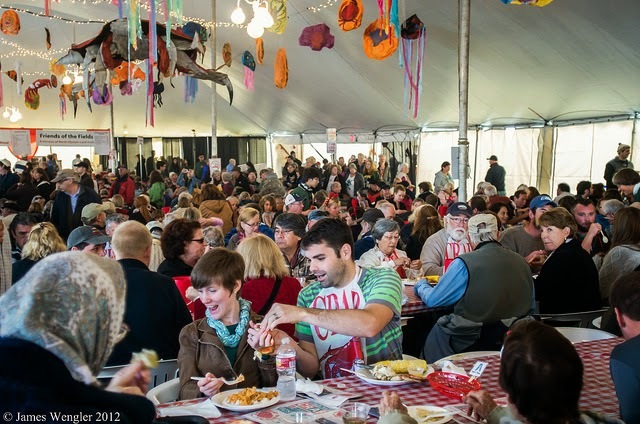 Oh my - the teacup is simply divine - and the crab festival looks like such fun. 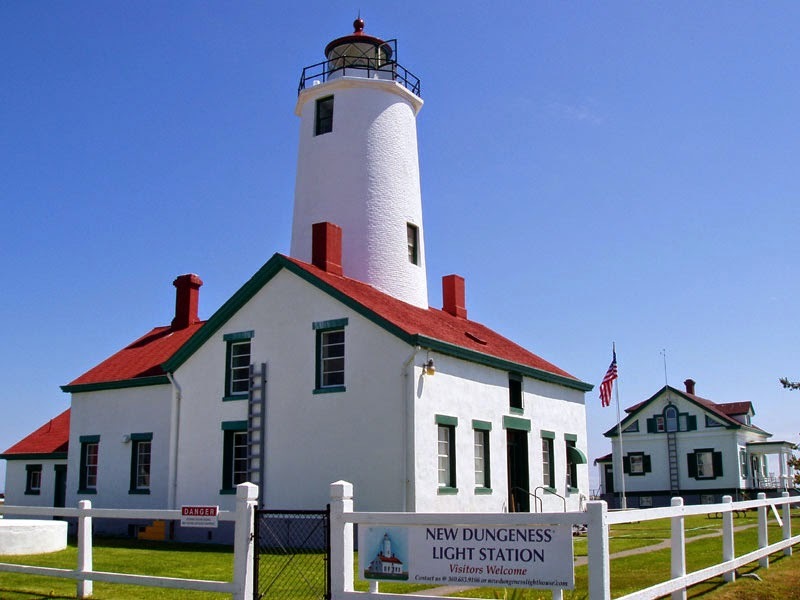 We always think we are going to get over to Sequim, but so far we've only been there once, and not during the crab festival. Happy week ahead. What a beautiful trio, Ruth, and perfect for Fall. 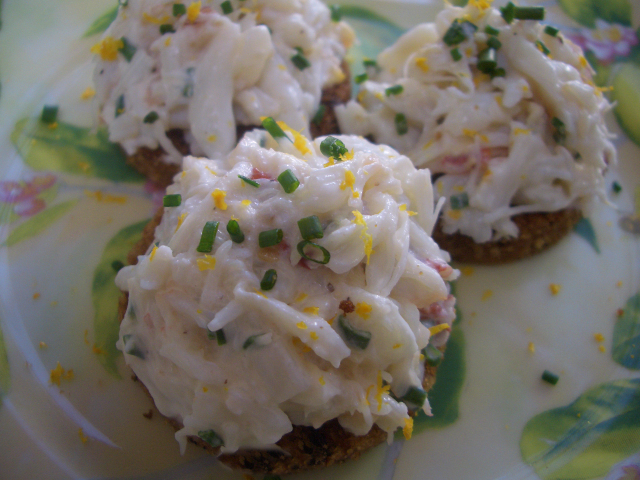 The crab salad on zucchini salad sounds like the perfect nod to the Crab Festival. I would love one of your cupcakes before I leave your party. I love candy corn, too, and had some last night, mixed with peanuts...my favorite, and tastes like a Payday candy bar. Thanks for hosting your party, Ruth! Oh that plateful of food looks sooo good! 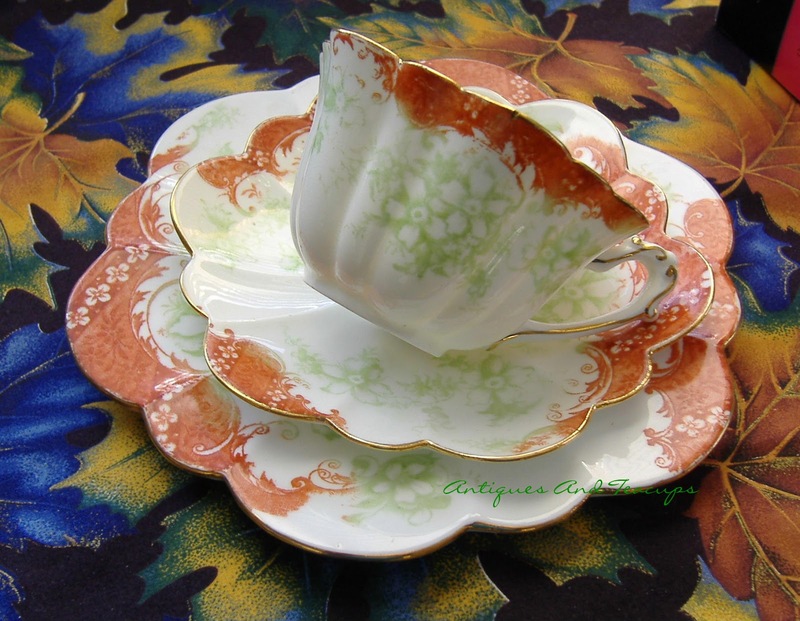 And I love the Victorian look of the teacup trio. Ruth, your teacup trio is just beautiful! I do love the frilly design; so dainty! 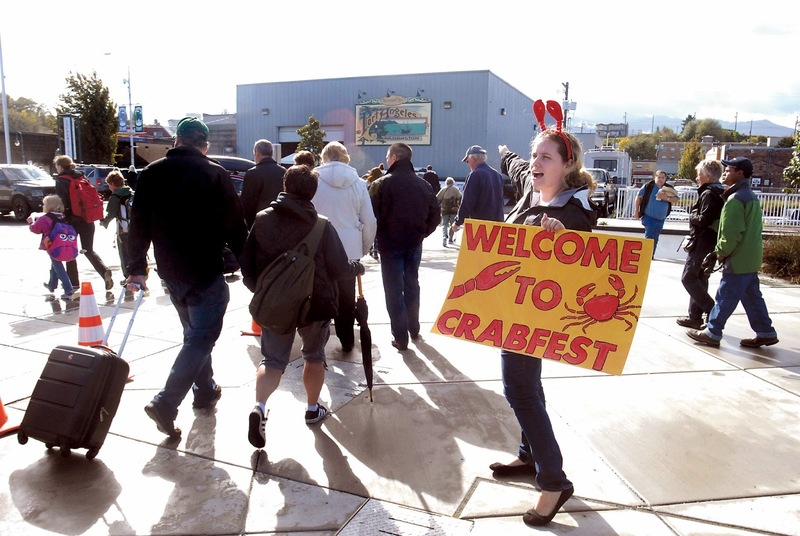 The crab fest sounds like fun and the food sounds delicious. Glad you have your power back. It is such a pain when it goes out. At least it is still a warm time of year. Thank you for hosting your lovely party and enjoy your day. Happy Halloween, Ruth! 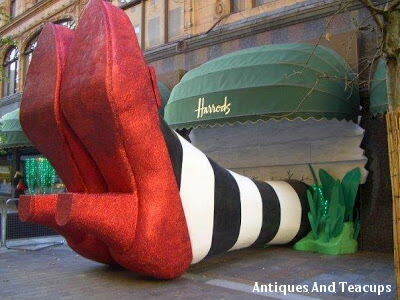 Love those ruby red slippers poking out of Harrods! Ruth, I've never seen a pattern quite like that one! Love this post. I'd definitely walk out to the lighthouse - I love lighthouses! I have just a day and a half left on the giveaway - hope everyone will enter! Thanks for hosting,Ruth!What a beautiful teacup!Hugs! 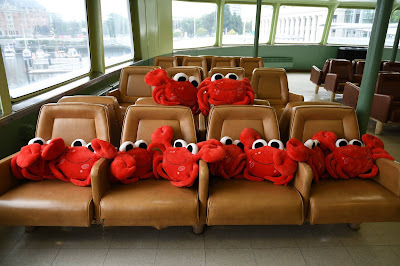 Your post has made me crabby! 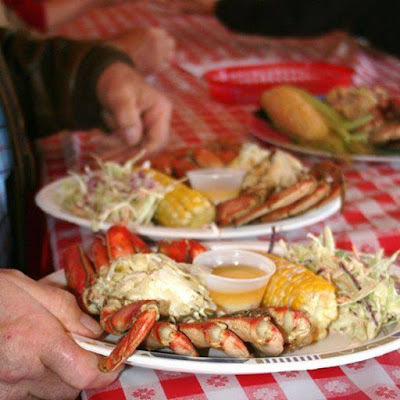 I'm salivating over all the delicious seafood dishes. Thank you for hosting and have a great week! What a beautiful trio! When I first saw it I thought it was a Shelly! Your mini cupcakes are so cute! I have the candy corn here so think I will make some! We have had real high winds here today and our power was out all afternoon. Crazy weather all over the states! 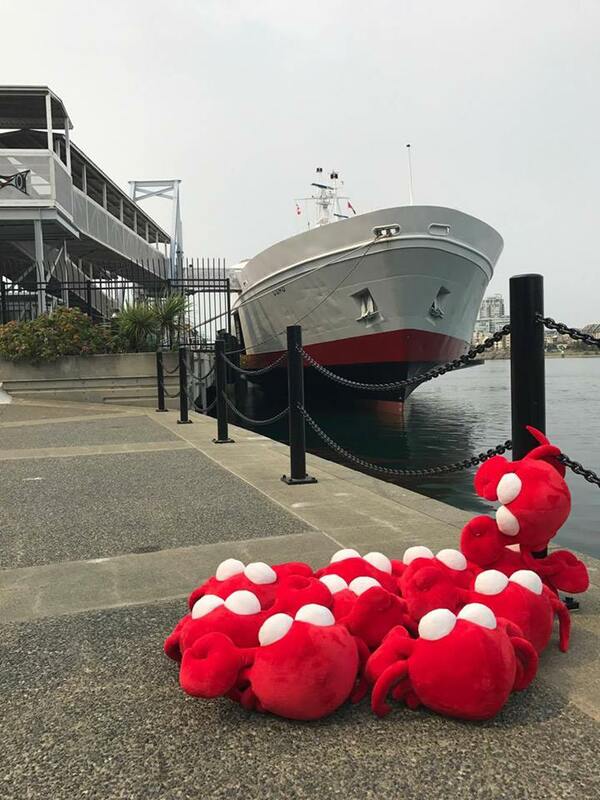 Thank you for hosting and hope you have a good week! Ruth, I had to come back with the travel post I just put up - actually took a photo of my breakfast tea one morning. I usually prefer china, but this rustic potter was really nice. I even looked at the bottom, thinking of you! But I don't have the info handy just now. I do remember that it's from England. Beautiful trio! Perfect for fall. I laughed out loud at the Harrod's Halloween "window" ... fun fun fun! 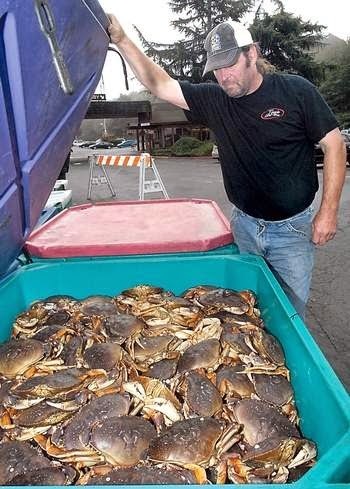 Oh Ruth, I love crab! It would be so fun to attend a festival like that. I love your tea cup and those witches shoes ae so cute! Thanks for sharing with SYC.